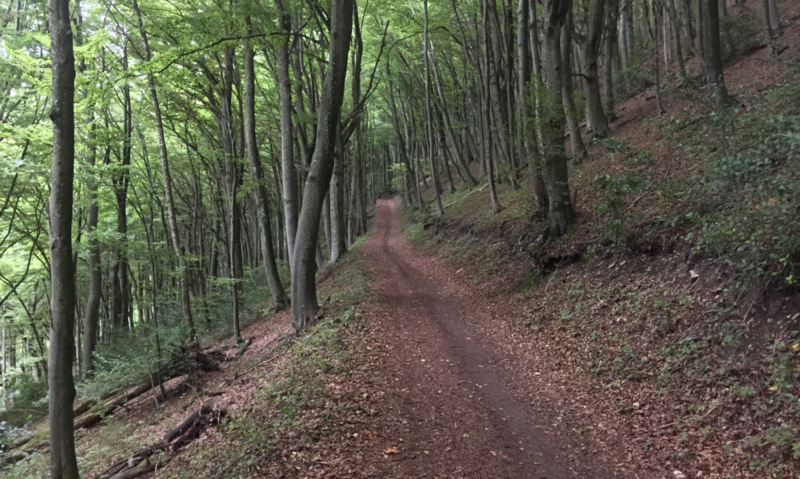 The Jura Crest trail spans from Dielsdorf to Nyon in Switzerland. It is my follow up project to the Via Alpina. 310 km or 192 miles long, more data about the route can be found here. There were also other somehow significant developments in my life recently. I started the JCT on a rainy day. The first 5 miles were quite spectacular. You start in a suburb town of Zurich, were all the people with let’s say, not the biggest incomes ever, live. They do all the background work required to keep a city like Zurich running. Faceless housing units with disproportioned expensive cars in front of them. Dielsdorf is connected to Zurich with a train system, the ride takes just 23 minutes and costs less than 5 bucks. The “monument” at the starting point…. From Dielsdorf there is a little climb to Regensberg, a small but fortified town founded in 11th century. From there it is ridge line walking over the so called Lägeren. This part of the journey is really nice. You come by a radar station from Skyguide, the privatized Swiss air traffic control company. Critics claimed that their privatized structures were somehow responsible for the midair crash of two commercial airliners in Überlingen. They have a nice panel on the building, explaining what they do. The illustrations make me smile. A Northrop F-5 fighter aircraft is carefully engraved to explain how the station works. In 1981 Switzerland had 98 of these fighter aircrafts in service. They were never up to the competition as they were developed in the US in times of the Vietnam war with poorer countries in mind, who could not afford better fighters. I personally helped to collect signatures to hinder the government to spend 3 billion for newer fighter jets. In 2014, they wanted to buy a Swedish product, called Gripen. I was even involved in strategical discussions within the struggle against new fighter jets (we won). For Switzerland, further armament makes no sense at all. The entire territory is encircled by NATO states but our doctrine is still autonomous resistance against everybody. A ridiculous concept as we are a small country. And then everything deteriorates on the JCT. 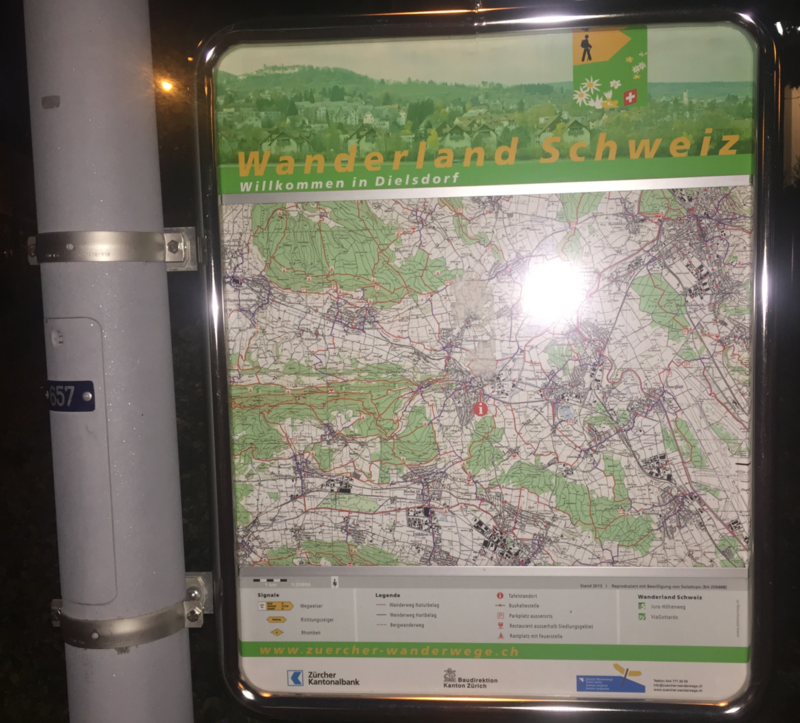 The way moves into the canton of Aargau. I do not recommend it. There is hardly a more boring part of Switzerland than the Aargau. Bad people claim that the Aargau is just a suburb of Zurich. It is however true that many youngsters from Aargau come to Zurich to enjoy nightlife (and thousands commute to Zurich for work). I cross the small city of Baden (not to be confused with Baden-Baden in Germany). It is Saturday, they have a market in the old city. There are elections for the city government soon. The current mayor is from the Green party. He had an affair three years ago and he tried to send her a selfie. Everything went well, but he apparently miscalculated the angle of his phone. Instead of the picture of his face, he sent her a picture of another part of his body. The voters didn’t reelect him. I worked in the national secretariat of the Greens when a newspaper launched the story as a scandal. Nobody of those in charge had heard the term crisis communications before but they still claimed that they are professionals, capable to handle the crisis. This scandal was, amongst others, responsible for the loss of votes for the Greens in the 2015 national elections in Switzerland. With the votes went the seats in parliament and with them the money and my job. I would not have wanted to work on in this environment with these co-workers anyway. It is a little laborious to explain to your friends again and again that you can’t explain to yourself why certain things are done in such ridiculous ways. I have never seen an organization that burned so much money with such a little effect. Perhaps I was spoiled from other organizations, whatever. To be fair: There were other changes since then at the Greens and they finally gained more competence. I am happy to leave Baden. The landscape remains boring. Even the cows seem to be bored. They run towards their fence and as everything is wet, they even slide. 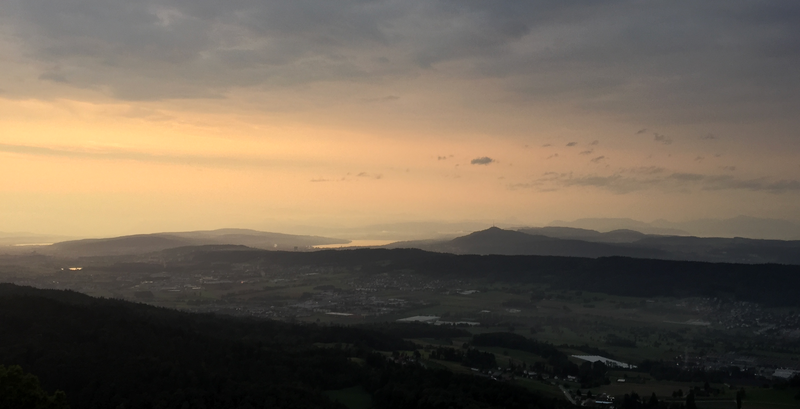 I pass the highest point in the canton Aargau. No difference in fogginess compared to somewhere else. I am so bored that I start to do artistic moves with my poles. I come by homeless couples and people taking care of bunkers. They have bumper stickers limiting the range of their cars to the countryside. There are apparently Antifa structures in bigger cities. The nuclear power plant of Gösgen is for once a welcome sight. It tells me that I’m near Olten. And after Olten things will improve (I know this because I grew up there). I have to cross more cow swamps. Then as a highlight of the day, I have to cross a horse patch. The horses seem to be bored also. My horse handling skills have rusted over the years. There is a gate and a marked way but the horses stand in the way. I ask politely and less politely. I am too afraid to touch them as I don’t want to make them angry. So, I go around the entire patch. I am highly rewarded as I spot an entire group of deer. Not just the usual road deer. In this part of the country they are really hard to spot. I arrive in Hauenstein at 19.10. The last shuttle down to Olten leaves in half an hour. I could walk on for hours but that would bring me to a remote part of the trail. I choose to go to a restaurant instead and I find only an upper level one. I offend the waitress with my dirty clothes and she is shocked when I tell her that I have to catch the last shuttle. I apologize several times and finally I find the right words by telling her that it is a pity to eat such refined food so fast. For the second time, I wear Speedgoats 2 shoes. They perform better than expected. The reason why I didn’t hike more in September is a little bit special. For the first time in over one year I do actually work for a commercial company. The work location is in the Romansch part of Switzerland, high up in the mountains. Thanks to the husband of my sister I can help to install a hybrid power network – it is work on a construction site. During the time I work there, I live with the family of my sister. The system we install, takes energy from four different sources. With solar panels, it generates electrical energy, the panels are coupled to a water cycle that cools them, thus improving their efficiency. This water is then pumped in a cycle to get the warmth but also to regenerate geothermal probes. More than 70 holes were driven 250 meters down in the soil. Plus, the entire system is again coupled to heath pumps who get energy out of natural warmth of the air. I do not have any formation in this field so I can only fulfill basic tasks. There are 322 solar panels who need two water and electrical connections each. We cut all the pipes, cables and installed the ground connection as flash protection. Everything is made of high quality components, most of them are made in Switzerland. The panels are made by Meyer Burger, the pipes by Georg Fischer. The cables are also locally sourced. I have to admit, that I never heard before from such a combination of power sources. The entire system is rolled out in Sedrun. The company installing it or somehow my employer, is itself also unique. 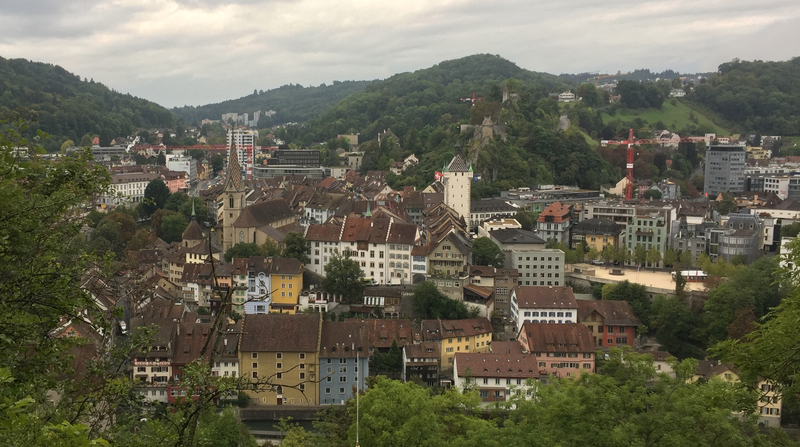 In this part of Switzerland there is no such thing like a market for workforce. There is just no additional worker around who can work with electrical power in a safe way and who would be ready to work in such a remote location. The company has its own small hydro-power plants and they maintain a family like work environment. They have the best equipment money can buy – I got one pair of pliers for more than 340 bucks from the German company Knipex, just to mount plugs on the cables. Same goes for the company issued clothes. As they have cold winters, everybody is given a real warm jacket. Their standard trousers are fire resistant, made out of aramid fibers. This is required by law in entire Europe but in Switzerland we like to stick closely to these requirements. All power tools are from Hilti. Because they are highly technical people they have unfortunately sometimes problems with process management. They always fear that there may be no more work in the future so they take on too many tasks in parallel. Everybody works 9 hours a day. We begin in the morning at 7 and end in the evening at 5. One hour is lunch break plus 15 minutes break in the morning. I have never before worked on a construction site. However, my hiker background and some additional hiker clothes helped to deal with the cold in the morning. We work on a flat roof. In the morning, everything is frozen and there is standing water. My winter tights keep everything toasty, Goretex keeps me dry. The boss of the company is also an ultra-runner. He noticed my Cascadias. Sorry, I can’t run or hike with them. I didn’t win the lottery recently, therefore I can’t get rid of shoes who cost me more than 200 bucks. We drive to Sedrun in the mornings with a company car – an all-electric BMW i3. It has a lot of punch.